CD4+ T-lymphocytes play a central role in regulation of immune response. Monitoring of CD4+ T lymphocytes is essential in assessing immune suppression and the disease progression of HIV-infected individuals. The estimation of CD4+ T cell counts is used to decide the initiation of Anti-Retroviral Therapy (ART), to monitor the efficacy of ART and to start treatment for Opportunistic Infections (OI’s). Low CD4+ T cell counts are considered to be a marker of the progression of HIV infection and AIDS, and have been called the “hallmark” of HIV infection. Blood samples from patients attending clinic at Mother of Christ Specialist Hospital Enugu, Nigeria were analysed. Flow cytometry was used in the estimation of CD4+ T cell count using dual platform approach and haemoglobin was determined using colorimetric method. One hundred (100) pregnant women comprising of naïve HIV positive (n=50) and HIV negative (n=50), attending ante-natal clinic aged 20-35 years participated in the study. Apparently healthy age and gender-matched non-pregnant women (n=50) served as control. The age distribution of HIV positive women revealed the highest occurrence in age range of 26-30 years. Both the CD4+ T cell count and haemoglobin values of HIV positive and HIV negative pregnant women were significantly decreased (p<0.001; p<0.05) when compared with the control. The CD4+ T cell count according to gestational age revealed significant decrease (p<0.01; p<0.05) in CD4+ T cell count of HIV positive and negative women respectively. The haemoglobin levels according to gestational age showed a significant decrease (p<0.05) in haemoglobin level of HIV positive pregnant women when compared with the control. This indicates reduction in CD4+ T cell count and haemoglobin level during pregnancy irrespective of the HIV status. Naïve HIV positive, CD4+ T lymphocyte, Pregnancy, Antenatal, Immunity. In the sub-Saharan Africa, Human Immunodeficiency Virus/ Acquired Immunodeficiency Syndrome (HIV/AIDS) is a global epidemic and about 68% of all people living with HIV resided in sub-Saharan Africa, a region with only 12% of the global population . In Nigeria, over three million people are living with HIV/AIDS. However, based on sentinel surveys of pregnant women, the country’s HIV prevalence appeared to have stabilized between 2005 and 2010-the median prevalence was 5% in 2003, 4.4% in 2005, 4.6% in 2008 and 4.1% in 2010 . The HIV prevalence in Enugu state, Nigeria declined from 6.5% in 2005 to 5.8% in 2008 and 5.1% in 2010 . A recent population based survey, showed a national HIV prevalence of 3.4% (3.3% for male and 3.5% females) while that of Enugu state was 1.4% (1.0% male and 1.6% females) . Nigeria ranks third among all countries for the total number of people living with HIV; about 1.7-4.2 million Nigerians are infected with the virus. The CD4+ T lymphocyte count and HIV RNA viral load are independent predictors of the course of HIV progression . People living with HIV/AIDS are more likely to become susceptible to diseases and develop opportunistic infections due to low CD4+ T lymphocyte count . The World Health Organization (WHO) stated that the prevalence of the disease is pandemic and that HIV positive pregnant women should begin antiretroviral therapy by second trimester. In the absence of effective antiretroviral therapy, the hallmark decrease in CD4+ T lymphocyte during AIDS results in a weakened immunosystem, impairing the body’s ability to fight infections or certain cancers such as apoptosis which can be induced by HIV through multiple pathways . In pregnancy, immune function is suppressed in both HIVinfected and uninfected women [7,8]. The state of pregnancy represents an extreme challenge for the immune system. The hormonal and immunological changes that occur over the course of pregnancy are necessary to support a healthy pregnancy, but also dramatically affect female susceptibility to autoimmune and infectious diseases . The maternal immune system during pregnancy is altered to actively tolerate the semi allogeneic foetus. These alterations include changes in local immune responses, that is, in the uterine mucosa (decidua) and changes in peripheral immune responses [10,11]. The change in the hormonal environment of pregnancy contributes to local suppression of cell mediated immunity at the maternal foetal interface . There is paucity of data on the impact of pregnancy on CD4+ T lymphocyte count and haemoglobin level in our locality. The study was designed to investigate the CD4+ T lymphocyte count and haemoglobin values of HIV-positive pregnant women, HIV-negative pregnant and non-pregnant women in Enugu, South-East, Nigeria and to determine the relationship between: CD4+ T lymphocyte count and haemoglobin of HIV positive pregnant women, HIV negative pregnant women and HIV negative non-pregnant women. The study was conducted at the Mother of Christ Specialist Hospital Ogui, Enugu, South-East, Nigeria. Mother of Christ Specialist Hospital Enugu is one of the pioneer hospitals selected for the caring and treatment of people living with HIV/AIDS, sponsored by the University of Maryland, USA under AIDS relieve organization. The study adopted the survey design. One hundred and fifty (150) women comprising of 50 naïve HIV-positive pregnant women; 50 HIV-negative pregnant women and 50 HIVnegative non pregnant (control) women aged 20-35 years participated in the study. About 4.0 ml of peripheral venous blood was drawn aseptically with sterile syringe from the participants and was transferred into a tube containing 0.2 ml of 4% ethylene diamine tetra acetic acid solution. Flow cytometry technique was used in the measurement of CD4+ T cell count using dual platform approach. The dual platform of flow cytometry approach uses haematology analyser to measure absolute lymphocyte count and flow cytometer to estimate the relative percentages of CD4+ T cells and the absolute CD4+ T cell number was calculated by multiplying absolute lymphocyte number with percentage of CD4+ T cells and dividing the product by 100 [13-15]. A modified methemoglobin method was used for the colorimetric determination of haemoglobin . The ethical approval was obtained from the Ethical Committee of the Mother of Christ Specialist Hospital Enugu, South-East, Nigeria. The informed consent was obtained from the participants before the study. Statistical analysis was done with statistical package for social science computer software version 21. Data were subjected to descriptive statistics and analysed using student’s t-test and one-way analysis of variance. Of the 150 women that participated in this study, 50 were naive HIV-positive pregnant women, 50 were HIV-negative pregnant women and 50 were HIV-negative non-pregnant women. The age distribution of HIV positive pregnant women was highest in age range of 26-30 years and the lowest prevalence occurred among HIV positive pregnant women in the age range of 31-35 years as shown in Table 1. The CD4+ T cell count and haemoglobin level of HIV-positive and HIV-negative pregnant women were significantly decreased (p<0.001; p<0.05) when compared with the control (Table 2). The CD4+ T cell count according to gestational age revealed significant decrease (p<0.001; p<0.05) in CD4+ T cell count in HIV-positive and HIV-negative pregnant women compared to the control and decreases as the gestational age increases (Table 3). The haemoglobin levels according to gestational age showed a significant decrease (p<0.05) in haemoglobin level of HIV positive pregnant women when compared with the control and also decreases as the gestational age increases (Table 4). Comparison of the CD4+ T-lymphocyte counts and the haemoglobin levels of HIV positive pregnant, HIV negative pregnant and HIV negative non pregnant women (control) based on age group revealed that HIV negative non pregnant women (control) had the highest CD4+ T-lymphocyte count and haemoglobin level in all the three age brackets (20-25 years, 26-30 years and 31-35 years); the lowest was found in HIV positive pregnant women (Figures 1 and 2). Table 1: Age distribution of HIV-positive women. Table 2: The CD4+ T cell count and haemoglobin of HIV-positive and HIV-negative pregnant women. Table 3: The CD4+ T cell count (cells/μl) according to gestational age. Table 4: The haemoglobin (g/dL) levels according to gestational age. 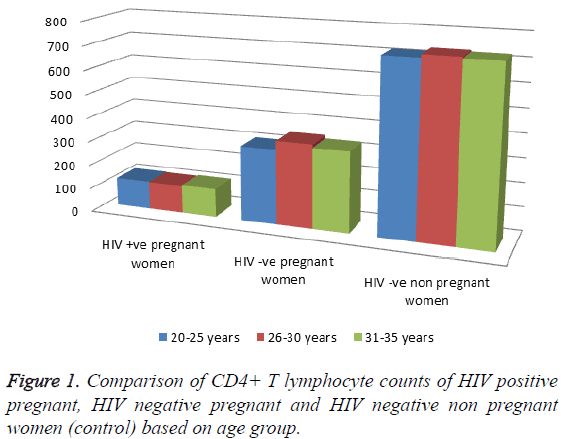 Figure 1: Comparison of CD4+ T lymphocyte counts of HIV positive pregnant, HIV negative pregnant and HIV negative non pregnant women (control) based on age group. 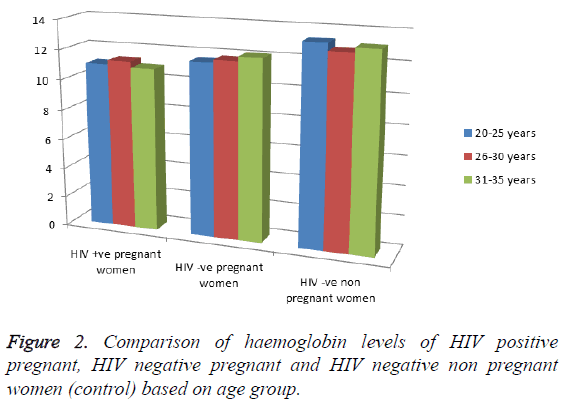 Figure 2: Comparison of haemoglobin levels of HIV positive pregnant, HIV negative pregnant and HIV negative non pregnant women (control) based on age group. The age distribution of HIV positive pregnant women was highest in age range of 26-30 years (Table 1). Previous researchers found that most Nigerian women become pregnant between the ages of 21-28 years when they are most sexually active . This may be the reason for the high HIV positivity at the age range of 26-30 years as recorded in this study. The CD4+ count and haemoglobin level of HIV-positive and HIVnegative women were significantly decreased (p<0.001; p<0.05) when compared with the control (Table 2). This finding shows that HIV positivity and pregnancy reduces CD4+ T cell count and haemoglobin level. This result may indicate that pregnant woman with HIV-negative status may have lower immune status compared with her counterparts in the Western world, where counts are in the range of 600-1500 cells per μl . The CD4+ T-cell count according to gestational age revealed significant decrease (p<0.001; p<0.05) in HIV-positive and HIV-negative respectively when compared with the control (Table 3). This shows that irrespective of the HIV status, pregnancy generally reduces CD4+ count. Comparing the CD4+ T cell counts in different gestational ages revealed a progressive decrease in the CD4+ T cell count of the HIV positive and HIV negative pregnant women as the gestational age increases. This could be attributed to increasing physiological demand during pregnancy. The changes in the hormonal environment of pregnancy contribute to local suppression of cell mediated immunity at the maternal foetal interface . However, HIV positive pregnant women recorded lower CD4+ T cell count at all the gestational ages when compared with the HIV negative pregnant women (Table 3). This finding confirms lower CD4+ T cell count in HIVpositive pregnant women. There was statistical difference (p<0.05) in the haemoglobin level according the gestational age when compared with the control (Table 4). This decrease in the haemoglobin level of HIV positive pregnant women could be attributed to antiretroviral treatment, haemodilution and bone marrow suppression. The results of this study confirm that CD4+ varies based on gestational age and also demonstrated decreased CD4+ Tlymphocyte count during pregnancy irrespective of the retroviral status. UNAIDS World AIDS Day Report 2011. Federal Ministry of Health (FMOH) of Nigeria: Technical report on the 2010 national HIV sero-prevalence sentinels survey, Abuja. Department of public health, National AIDS/STI control programme, FMOH 2011. Federal Ministry of Health (Nigeria). National HIV and HIV and reproductive health survey, 2012. NARHS Plus 2013. Cardillo M, Hagan R, Abadi J. CD4 T-cell count, viral load, and squamous intraepithelial lesions in women infected with the human immunodeficiency virus. Cancer 2001; 93: 111-114. Brunetta PM, Bailes E, Chaudri RR, Rodenburg CM, Santiago MO, Hahn BH. The origin of acquired immunodeficiency syndrome viruses, where and when? Philos Trans R Soc Biol Sci 2010; 356: 867-876. Giovanni I, Masanor M, Patizial C, Maria A, Lowerstain PR, Chisan FV, Riggei ZM. Platelet medi-cytotoxic T-lymphocyte induced liver damage. J Med 2005; 11: 1167-1169. Minkoff H. Pregnancy and HIV infection. In: HIV infection in women. New York, Raven Press. 1995; 173-188. Rich KC, Siegel JN, Jennings C, Rydman RJ, Landay AL. CD4+ lymphocytes in perinatal Human Immunodeficiency Virus (HIV) infection: evidence for pregnancy-induced immune depression in uninfected and HIV-infected women. J Infect Dis 1995; 172: 1221-1227. Raghupathy R. Th1-type immunity is incompatible with successful pregnancy. Immunol Today 1997; 18: 478-482. Bulmer JN, Pace D, Ritson A. Immunoregulatory cells in human decidua: morphology, immunohistochemistry and function. Reprod Nutr Dev 1988; 28: 1599-1613. Chen SJ, Liu YL, Sytwu HK. Immunologic regulation in pregnancy: from mechanism to therapeutic strategy for immunomodulation. Clin Dev Immunol 2012; 183-184. Bakalov VK, Link AA, Dimition MA. IL-12 TNF-alpha and hormonal changes during late pregnancy and early post-partum: Implications for autoimmune disease activity during these times. J Endocrinol 2001; 86: 4933-4938. Center for disease control. Guidelines for the performance of CD4+ T-cell determinations in persons with human immunodeficiency virus infection. MMWR 1992; 41. O’Gorman MR, Gelman R. Inter and intra-institutional evaluation of automated volumetric capillary cytometry for the quantitation of CD4- and CD8-positive T lymphocytes in the peripheral blood of persons infected with human immunodeficiency virus. Site investigators and the NIAID new CD4 technologies focus group. Clin Diagn Lab Immunol 1997; 4: 173-179. World Health Organization (WHO). Laboratory guidelines for enumerating CD4 T Lymphocytes in the context of HIV/AIDS 2007. SEA-HLM-392. Palmer WW. The colorimetric determination of haemoglobin. J Biol Chem 1918; 33: 119. Sagay AS, Imade GE, Nwokedi EE. Human immunodeficiency virus infection among antenatal patients in Jos, Nigeria. Int J Gynaecol Obstet 1999; 66: 183-184. Lemoha E, Audu RA, Akanmu AS. Evaluation of correlation between CD4 cell count and haemoglobin in HIV-infected patients in Lagos. Abstract presented at the 4th national conference on HIV/AIDS. International Conference Centre, Abuja, Nigeria 2004.